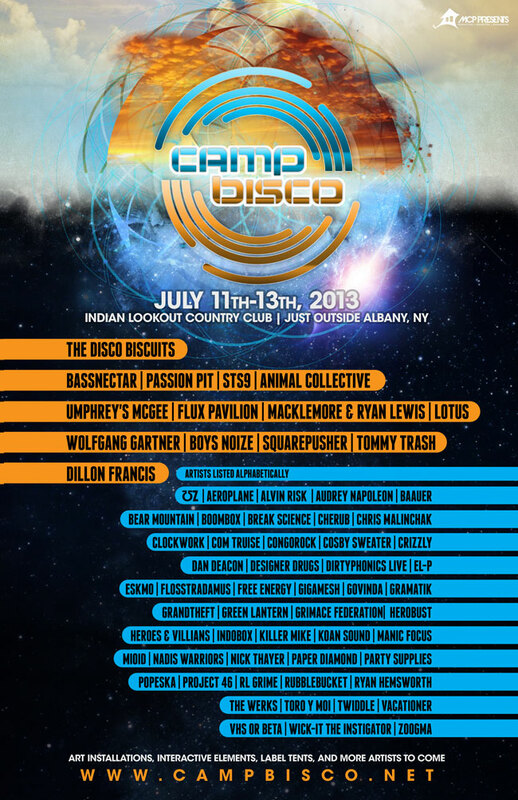 Camp Bisco returns to Mariaville, New York this July 11 through 13, 2013 for its seventh straight year at Indian Lookout Country Club. Always one of the highlights of summer festival season, the eclectic music lineup for this year’s Camp Bisco is once again impressive,featuring some of the biggest DJ names in EDM, as well as live acts in genres ranging from electronica, to hip-hop, to rock. This year, the festival will enhance its expansive dance tents with surround sound and add greater concert production to all stages. From large-scale art installations and artist workshop,s to performance art demonstrations, carnival rides, and more, Camp Bisco is also increasing the interactive elements in 2013 to create an even better festival experience for patrons. Long distance shuttles will also return in 2013, offering service from Albany, Baltimore, Boston, New York City and Philadelphia. As they do every year, early bird tickets flew off the virtual shelves but it’s not too late to secure your general admission or VIP tickets to this year’s Camp Bisco! Once again, Independent Philly will there to cover all 3 days of Camp Bisco and we hope you’ll join us in NY for what promises to be one of the best events of 2013!